Stan Against Evil came back for a third season on Halloween night, and boy, am I glad. The enthusiastically silly and low budget show continues to be a bright spot on IFC’s schedule. It has embraced its humble status and run with it, cementing its place as a goofy and sometimes sweet horror comedy well worth watching. The show still looks as if all the special effects come from Party City. It still careens cheerfully from one joke to another with only a nod at coherence and character development. But I can’t hold that against it. Because Stan Against Evil is still escapist fun with an occasional dose of sentimentality, and the cast pulls it off without missing a step. Former Sheriff Stan Miller (John C. McGinley) and his replacement, Evie Barret (Janet Varney) have become the best of friends, with his curmudgeonly snark nicely balanced by her occasionally off-kilter practicality. Deputy Leon (Nate Mooney) is more loopy and oblivious than in season’s past, but is still a core team member. And Denise (Deborah Baker Jr.), Stan’s daughter, still presents as a thirty year old going on thirteen, crafting, fan-girling, and inappropriately attaching at every turn. Her romantic interest from season two hasn’t reappeared yet, but the season is young. Evie’s daughter, never being much more than a prop, has pretty much disappeared from the show. But Evie’s boozy ex-husband seems to be a recurring character when a random monster is needed to give a plot a boost. The overarching storyline from season one remains in place: Tiny, rural Willard’s Mill, New Hampshire is cursed. Back in 1693, the evil Constable Eccles burned 172 witches at the stake. Since then, every constable the town has ever had has died in office. Except Stan. Stan Against Evil’s unexpected second season introduced a lot more information about Stan’s late wife and her coven, the Black Hat Society, who protect the town from the worst attacks by Eccles and other evils. And now the even more unexpected season three has the crew still fighting off demons as Constable Eccles’s victims keep returning to exact revenge. Stan is still trying to find a way to bring his dead wife back to life. And the writers still keep everyone off-balance and well-armed with one-liners. 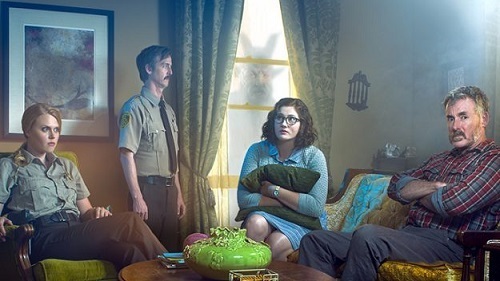 Stan Against Evil launches into the new season with its usual verve. Episode one features an undead Stan and an institutionalized Evie in their own private hells (which look remarkably like someone just threw garbage around in the street), learning to work through issues together. There is a bit of random time travel, and some wonderful bedside manner from the resident psychiatrist. Episode two features lessons in how to use evil for the greater good, a knock-off Mulder and Scully, and even Kolchak running around snapping pictures as Stan and Evie try to figure out how most of the Black Hat Society died. Apparently, bringing your own rubber gloves is important in investigations. Each season is only eight half-hour episodes broadcast over the course of four weeks. A few episodes are free on IFC, and seasons one and two are available for binging on Hulu. I highly recommend it. Stan Against Evil is a far better treat than leftover candy. 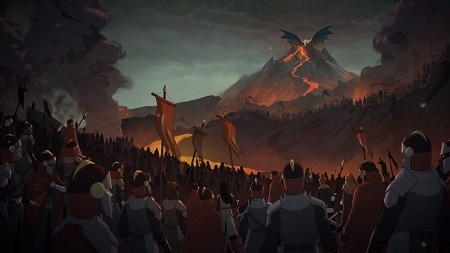 The Dragon Prince is quite simply wonderful. Netflix’s new epic fantasy is intended for kids, but like all great literature it is able to speak to everyone. There are often facile lessons, or missing nuances, in young adult fantasy (okay, in adult fantasy, too). But not so The Dragon Prince. The balance of light and dark rings true. There are unlikely alliances, unbreakable oaths, and awakening magic. The action is exciting and the world-building immersive. And while The Dragon Prince is an unabashed, sweeping saga, it is also warm and funny. There are elements of Heavy Metal, hints of ElfQuest, a healthy dose of Lord of the Rings, and even a bit of Archer in the character renderings. Snarky and self-aware, the dialogue slips in plenty of pop-culture: “I was trying to sweep the leg”, “Winter is coming…eventually”, and “Say ‘hello’ to my little friend” are all uttered at various points. It’s been a long time since I so thoroughly enjoyed an animated series the way I enjoy this one. Long in the past, humans discovered dark magic and were driven to the edge of the continent by elves and dragons. The story begins a few years after King Harrow murders the ancient dragon king and destroys his egg, bringing the humans and the elves to the brink of war. Elvish assassins infiltrate the kingdom to kill Harrow and his heir, Prince Ezran. Rayla, a young elvish assassin, finds she cannot take an innocent life. Instead, she helps Ezran and his half-brother Callum escape the assassination attempt after Ezran discovers the dragon’s egg hidden in the castle dungeons. The three then embark on a dangerous, epic quest to return the dragon’s egg to its mother. Created and written by Aaron Ehasz (Avatar: The Last Airbender, Futurama) and Justin Richmond (Uncharted 3: Drake’s Deception), The Dragon Prince is richly imagined and beautifully presented, with gorgeous artwork, a soaring score, and a full magical world. Like many fantasy sagas, The Dragon Prince is stuffed with creatures borrowed from the classic, but they have been tweaked to fit their new world. The huge worm is a mountain dweller. The giant spider is an illusion. The dragon-slayers are not the good guys. The characters are fully developed, diverse and inclusive, with their own complicated relationships and internal lives. The emotions behind their actions feel honest. The moral lessons are clear but the story refrains from hitting viewers over the head with them. The characters are almost entirely normal people–or as normal as elves, mages, and royalty can be. Some are clearly the bad guys, but they have recognizable reasons for what they do. There are, so far, no real caricatures among them. The three main characters are strongly drawn without falling back on genre stereotypes. Jack De Sena plays Callum, the fourteen year old half-brother to the heir apparent, with an excellent blend of adult responsibility and adolescent insecurity. Paula Burrows portrays the elf-assassin Rayla with terrific conviction and a charming, thick Scottish accent. Sasha Rojen plays the child-prince Ezran as a thinking, feeling, learning person with convincing agency and autonomy. The secondary characters are also well done. Luc Roderique is King Harrow of Katolis, stubborn, proud, and trying his best to protect his people. Jason Simpson plays Viren, the King’s treacherous advisor, who may or may not be a good man underneath it all. Viren’s children Claudia and Soren are portrayed convincingly as close siblings by Racquel Belmonte and Jesse Inocalla. And Jonathan Holmes gives the elvish assassin leader Runaan a fierce and enduring code of honor. It’s rare to find something so well-done, so dedicated to its vision, so vibrant and enjoyable. The Dragon Prince is that something. I recommend it without reservation. 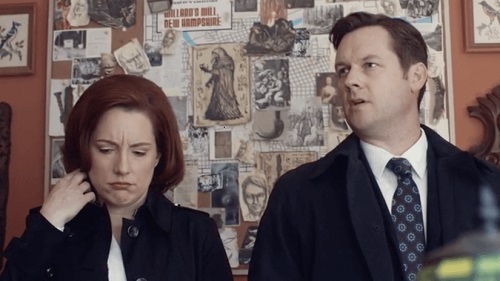 Ghoul, the new three-episode miniseries from Netflix, generates its chills with a blend of tried-and-true tropes borrowed from multiple well-known films and a dash of modern dystopia. While the derivative nature of the scares is a downside, Ghoul political dimension provides a different layer of darkness. Overall the film is a predictable but effectively-done horror movie, with an engaging cast and plenty of well-placed gore. Ghoul unfolds in a near-future India that has fallen into fascism, with secret prisons, brutal re-education, enforced political orthodoxy, and questions of how religion impacts patriotism. The story centers on Nida, a young Muslim woman training to be a government interrogator. Her father refuses to toe the political line. She turns him in, choosing patriotism over faith and family. Soon after, she finds herself assigned to a secret interrogation center where the arrival of a dangerous new prisoner sends the whole command structure spiralling into chaos and death. Nida is played with great sincerity by Radhika Apte. S. M. Zaheer is her stubborn, seditious father. Manav Kaul is sympathetic as the drunk and troubled Colonel Sunil Dacunha, the man in charge of the prison. Ratnabali Bhattacharjee’s Lieutenant Laxmi Das is convincingly twisted as Dacunha’s duplicitous second in command. And Mahesh Balraj brings a creepy stoicism to the monstrous terrorist Ali Saeed. Anyone who watches horror movies will recognize plenty of familiar tropes. But an old story told well is still worth watching. And I think Ghoul tells its old story well. The film is atmospheric, with a haunted house vibe that uses the desperation of The Blair Witch Project, the industrial oppression of Alien, and the paranoia of The Thing among its many inspirations. Visually, the decrepit prison setting where Ghoul happens is also very familiar. Built as a bunker against nuclear attack, the site is of course not in any official records. But the film adds a few extra details that ramp up the totalitarian mood. Black-painted windows disguise night and day. Exterior shots of brutalist architecture reinforce the heavy-handed repression at work in this society. The incessant rainfall outside the massive buildings produces its own claustrophobia. Everything is bleak, dull, and colorless, except for the stunning splashes of red when the monster is revealed. And the reveal comes quickly. Unlike the graveyard-dwelling, corpse-eating demon of pre-Islamic folklore, the ghoul in Ghoul is a demon of vengeance summoned in retribution. It takes the form of the last person whose flesh it ate, but here it teases out confessions of guilt before it attacks. Ghoul is written and directed by Patrick Graham with inconsistent levels of subtlety. The dialogue is at times very formal and stagey, with power struggles and plot turns telegraphed far in advance. The plotting is slow, grim, and pointed. Terrorism and political orthodoxy are major themes, as is suspicion of any display of faith. If there was any doubt about the point Graham was aiming at, the pile of pulled gold teeth and a crematorium should remove it. The three episodes could have easily been trimmed to two hours. The padding betrays its origins as an intended feature film. It is still creepy as hell. The slowness, the obvious references, even the predictability of events do not diminish the skill of the cast and the strength and style of the storytelling. Ghoul may not break any new ground, but it is a solid reminder of why stories like it continues to be retold. 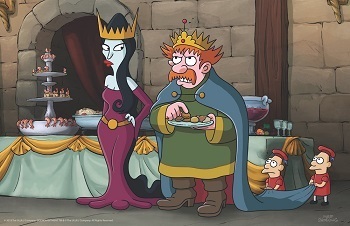 Disenchantment, Matt Groening’s new series for Netflix, certainly has its own unique charms. It is no Futurama. It is certainly not The Simpsons. While there are, of course, similarities to Groening’s earlier work, this new show is something that aspires to be a heartfelt, ongoing saga while still capturing the goofy spirit of the other series. So far, Disenchantment has had some difficulty in finding its direction. The first season is a rather uneven journey, but it’s definitely on the right track. The series follows the adventures of Princess Tiabeanie Mariabeanie De La Rochambeaux Drunkowitz of Dreamland, known more economically as Bean. She is a boozy, rebellious teenager who is constantly at odds with her father, King Zøg, her stepmother, Queen Oona, and her half-brother, Prince Derek. Bean’s only friends are her nursemaid, Bunty, Elfo the renegade elf, and Luci, Bean’s very own personal demon. She is also dealing with the loss of her mother, Queen Dagmar, who died when Bean was just a baby. There are arranged marriages, diplomatic debacles, political machinations, crusades, curses, enchantments, and the occasional tavern brawl. There are witches, wizards, debauched fairies, transformed princes, giants, griffins, and three-eyed counselors. Castles, dungeons, and side-quests abound. There is also a whole lot of family drama. I think Bean’s relationship with her father is well-done. King Zøg has what may be a good heart inside his crusty royal shell. And for all her push-back, Bean loves her dad. I also find Queen Oona refreshing as the not-actually-mean stepmother, who manages to be both bizarre and boring in her stepdaughter’s eyes. The characters are portrayed by Abbi Jacobson, Eric Andre, Nat Faxon, John DiMaggio, Tress MacNeille, Matt Berry, David Herman, Maurice LaMarche, Lucy Montgomery and Billy West, with great enthusiasm and thoroughly random accents. Unfortunately, the main characters’ personality traits are also somewhat random from one episode to the next, which makes it harder to become fully invested in them. Bean’s scattershot behavior is at least excusable for a confused teenager, but the writers don’t seem to have a good handle on Elfo and Luci. Both of these characters are frequently out of character, with Elfo in particular swinging wildly from innocent to cynical and a number of points in between. On the other hand, the minor and incidental characters are wonderful, my favorites being the King’s two pages (who I suspect are Akbar and Jeff) and a knight’s overprotective mother. 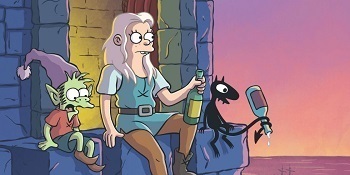 Disenchantment is not quite a sitcom like Groening’s other shows. It is a sharp comedy with a lot more going on inside the jokes. It mocks the conventions of the whole fantasy adventure genre while embracing the threats and dangers inherent in it. Disenchantment is frequently laugh-out-loud funny, and other times quite sentimental. The show has already taken a few serious turns. There have been several on-screen character deaths (some more permanent than others), played for comedy and for genuine tragedy. The initial impression I get of the series was that it is still feeling its way. The thread connecting all the scattered plot points was too obvious to ignore, but still hard to follow. Then the final few episodes managed to not only tie most of the story together, but to take it into unexpected and promising territory. That sudden turn is one of the strongest reasons I can give to watch. With all its inconsistencies and slightly blurred focus, I like Disenchantment. A lot. There is an unexpected and welcome warmth to it, and what I hope is the promise of something more substantial to come. Castle Rock is Hulu’s finely-crafted ode to Stephen King’s intricate world-building. 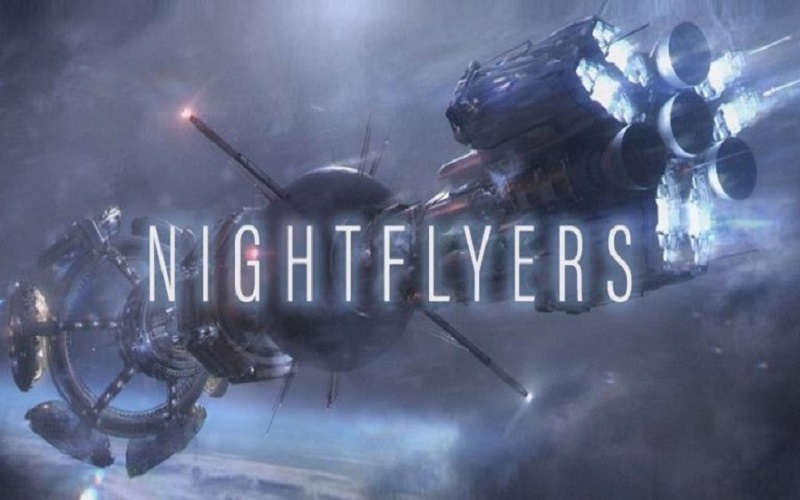 The series is faithful to the author’s voice and deep sense of nostalgia, and brimming over with familiar names and references. 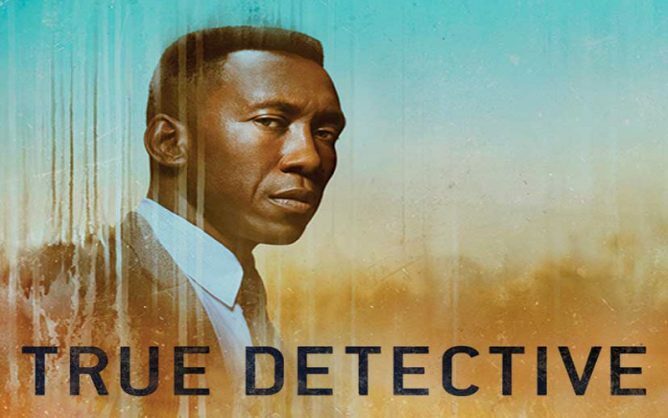 Originally released on July 25 and with the first season still unfolding, it has already been renewed for a second season. If it can grow past the limits of the familiar and the nostalgic, I am heartily behind it. So many threads from King’s mythos are knit together here that anyone familiar with his work will have no problem finding their bearings. The show is built layer upon layer, with a deeply felt sense of the community and its people. It highlights the skill King has always had of making his world big enough for his characters to have lives outside the confines of any particular story. Castle Rock also evokes all the familiar themes of King’s work. It features good, decent, damaged people fighting their dark sides and often failing. There are the expected flashbacks to twelve-year-olds facing the origins of coming horror, godly true believers and evil incarnate, pedophiles, and magical African-Americans. And, of course, there is well-placed classic rock and blues. The cast is outstanding. André Holland plays Henry Matthew Deaver, death-row attorney and prodigal son at the heart of the unfolding mystery. Bill Skarsgård is…unnatural…as The Kid, a nameless prisoner discovered in a pit at Shawshank State Penitentiary. Scott Glenn gives retired sheriff Alan Pangborn a determined vitality, while Melanie Lynskey’s Molly Strand shows a quiet desperation beneath her ambition. Rounding out the main cast are Jane Levy as Jackie Torrance, writer and font of local knowledge, and Noel Fisher as Dennis Zalewski, a Shawshank prison guard who sets the story in motion while trying to do the right thing. 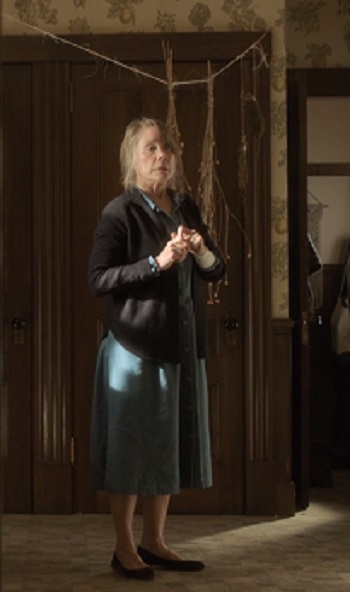 Assorted minor characters are well represented by the talented likes of Ann Cusack, Terry O’Quinn, Frances Conroy, and Rory Culkin, among many other. But the absolute standout is Sissy Spacek. She brings the same convincing blend of fragility and strength to Ruth, Henry’s fierce and failing mother, as she did to her portrayal of Carrie in 1976. Episode 7, “The Queen”, is a star-turn. As good as Castle Rock is, it isn’t perfect. It takes itself very seriously, and the portentousness does wear after a while. At times the plot twists broadcast themselves, as when Alan teaches Ruth how to do sleight-of-hand. And a few characters have (so-far) opaque or non-existent motivations. This ends up creating inconsistencies in otherwise beautifully drawn characters. One false note is Jackie Torrance’s actions upon meeting the Kid. Another is Alan Pangborn’s wild goose chase. Both are clearly the needs of the plot, and not natural reactions from the characters. The sudden addition of Henry’s son to the goings on also feels like a set-up rather than a character-driven decision. And just and aside: While this is definitely a show for adult audiences, the graphic depiction of animal deaths surprised me. Human carnage? Not a problem. But I didn’t expect the Mr. Jingles stand-in to meet that particular fate on-screen. The emerging evil in Castle Rock is signaled by wildfires, mass shootings, suicides, and ugly family conflicts. But while all the trappings and affected characters are comfortably familiar, the show has not so far taken that familiarity in a new or challenging direction. 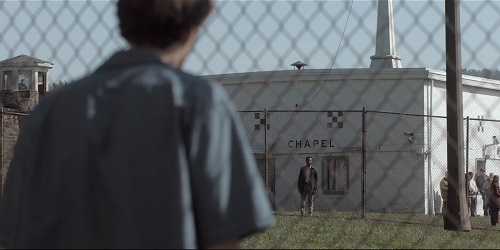 Castle Rock is a wonderfully done pastiche of all things King, but I am interested in seeing it grow beyond that. There are still three more episodes for Season One. Bobcat Goldthwait’s Misfits &Monsters is, not surprisingly, pretty strange. Goldthwait–a man known for his incredibly dark sense of humor– writes, produces, and directs the new comedy series airing on TruTV with a fully self-aware sense of the absurd. So far, the half-hour episodes play more like Tales from the Crypt than the Twilight Zone. Foul language abounds, blood flows freely, and even the background characters are scathingly cynical. Truly, there is something for everyone. Misfits & Monsters begins its run with “Bubba the Bear”, a fairly standard tale of a children’s cartoon come to life. 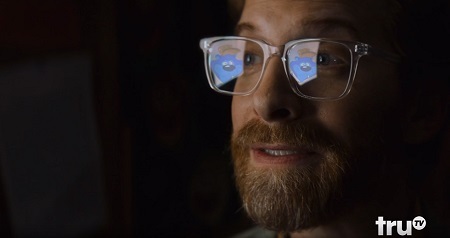 Seth Green (Robot Chicken, Buffy the Vampire Slayer) stars as a mild-mannered voiceover actor whose work comes back to bite him. Bubba the Bear is the role he inherited when the original voice actor had a breakdown and was institutionalized. But Bubba isn’t happy with how he is portrayed, and breaks into the real world to make his point. Graphically. “Bubba” ends exactly as you expect it to, which is quite all right. The second episode is “Face in the Car Lot”, a 1970s-set extravaganza of politicians and other creatures of the night. Starring David Koechner (Anchorman, The Office) as car-salesman turned presidential candidate Del Wainwright and Tara Lynne Barr as the plucky reporter trying to prove he’s a werewolf, this episode plays like an extended comedy sketch. When asked what scandals may come up during the campaign, Wainwright confesses, “I ate a toddler once. When I was a werewolf.” This is not enough to derail his campaign–not by a long shot. A hippy vampire shows up with evidence of the crime, but the political machine just keeps rolling. Many of the lines are lifted almost verbatim from current commentary, tweaked lightly for lycanthropy. It is at once enjoyably silly and quite uncomfortable to watch. 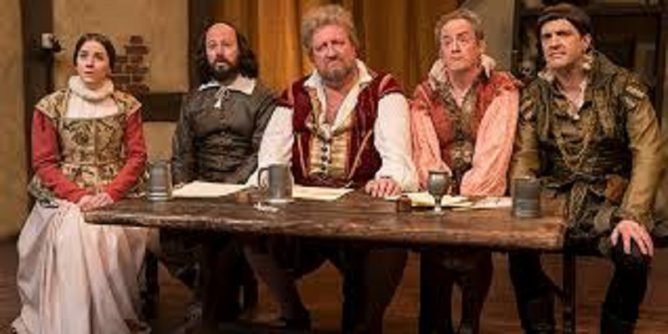 There are six more episodes to round out the first season, but TruTV doesn’t give viewers the opportunity to binge. Which, based on the first two installments, I totally would. 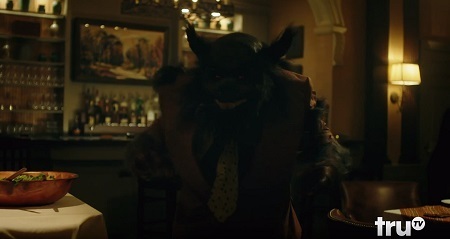 What I’ve seen so far of Misfits & Monsters is refreshingly goofy. The show is smart enough to be interesting but not so full of itself to wear out its welcome. The stories presented thus far are pretty standard, with the plot twists broadcast early on. But Goldthwait still gives them enough of a snarky twist to make their conclusions funny and satisfying anyway. I would have to categorize Misfits & Monsters, broadly, as familiar tales well-told. And I look forward to more of that in the rest of the season.